Is foot pain or discomfort preventing you from living your life comfortably? If you are tired of foot pain, heel pain, pain from plantar fasciitis, or arch pain; we may have supportive Arch Supports in Santa Ana to help reduce or eliminate your pain. At Lucky Feet Shoes of Santa Ana, we carry a variety of arch supports to help alleviate foot pain from common foot problems that develop from not having enough orthopedic support when you walk or stand. Therefore, keep reading for a detailed list of some of the most supportive arch supports in Santa Ana. The Aetrex Lynco L2220 is designed to provide unsurpassed comfort and support in most footwear styles. This arch support features slow recovery IQ15 memory foam that customizes to the shape of the foot to help create a pressure-free environment in your shoes. In addition, a soft CopperGuard top cover made form state of the art copper fibers help prevent bacteria, fungi, and odor. Options include metatarsal support to provide additional protection at the ball-of-the-foot and medial posting to gently realign the rearfoot and control over-pronation. This Aetrex Lynco L2200 is definitely one of the best arch supports in Santa Ana. REARFOOT POSTED – Controls over-pronation and balances rearfoot. FOREFOOT NEUTRAL– Without metatarsal support for those not suffering from ball-of-foot discomfort. The L2400 series arch supports are customizable and designed with removable gel plugs. Since our right and left foot are not mirror images, these L2400 arch supports allow you to modify for differences in your feet. You can customize the Aetrex Lynco L2400 in a matter of seconds. Simply peel off the gel pads. This model is a little thinner than the memory foam L2200 model, so they can easily fit into most shoes with regular removable insoles. DEEP HEEL CUP– Features the widest and deepest heel cup that offers maximum support and can help with natural shock absorption. BIOMECHANICAL SHAPE– Has the most shape to help stabilize and support the foot, which can help. reduce stress on feet, ankles, and knees. ORGANIC, ODOR-CONTROL COATING– All natural coating that eliminates odor-causing bacteria. Superfeet Green is an affordable, professional-grade orthotic that offers amazing support, performance, and comfort for anyone who wants their footwear to fit and feel better. The Superfeet Green is a firm, heavy-duty shock absorbing insole offers you maximum support while providing stability. Many of our customers with high arches prefer the Superfeet Green arch supports for the best hold on their arch when walking or running. In addition, this Superfeet Green features a hard plastic bottom that takes some time getting used to, but it’s an excellent shock absorber. This Superfeet Green is definitely one of the best arch supports in Santa Ana. BIOMECHANICAL SHAPE- Has the most shape to help stabilize and support the foot, which can help reduce stress on feet, ankles, and knees. When thick insoles are not an option, the Superfeet Blue is a long-lasting support packed into a thinner, high-performance arch support to help improve your fit of a wide range of footwear. This thinner Superfeet arch supports helps support and cushions your foot for long-lasting comfort minus the bulkiness. This Blue insole is thin enough to help improve the feel of most footwear. Most people with low to medium arches have experienced the best results with these. If you happen to have low arches, stick to the Blue rather than the Green. HIGH-DENSITY FOAM- Closed-cell foam supports and cushions the foot for long-lasting comfort. STABILIZER CAP- The base of the insole that supports the rearfoot and provides structure and stability to the foam layer. HEEL CUP- Helps position the heel to naturally absorb impact. Lucky Feet Shoes Dress Arch Supports without Met Pad are a perfect ¾-inch arch supports that can easily fit into a wide range of shoes including athletic, casual, most dress shoes. They effectively support your arches and evenly distribute pressure across your whole foot. Their built-in foot arch support increases stability and reduces excessive motion; preventing your feet from flattening out and limiting pronation. In addition, they help minimize stress on your knees, hips, back, and feet; helping prevent flat feet and promoting proper body alignment. Overall, they were designed to provide unsurpassed comfort throughout your busy day. STRESS REDUCTION– Reduces stress on your knees, hips, back, and feet. PRESSURE DISTRIBUTION– Evenly distributes pressure across your feet and aligns your body. Fits into a wide range of shoes including athletic, casual, and most dress shoes. Just like the Lucky Feet Shoe without Metpad, the Lucky Feet Shoes Dress Arch Supports with Met Pad are a perfect ¾-inch arch supports that can easily fit into a wide range of shoes including athletic, casual, most dress shoes. They effectively support your arches and evenly distribute pressure across your whole foot. Their built-in foot arch support increases stability and reduces excessive motion; preventing your feet from flattening out and limiting pronation. The only difference between the two is the built-in metatarsal pad, which works great to target foot pain and adds additional comfort to most shoes. They help minimize stress on your knees, hips, back, and feet; helping prevent flat feet and promoting proper body alignment. Overall, they were designed to provide unsurpassed comfort throughout your busy day. This Lucky Feet Shoes with Metpad is definitely one of the best arch supports in Santa Ana. MET PAD- Built with a met pad for additional metatarsal support. 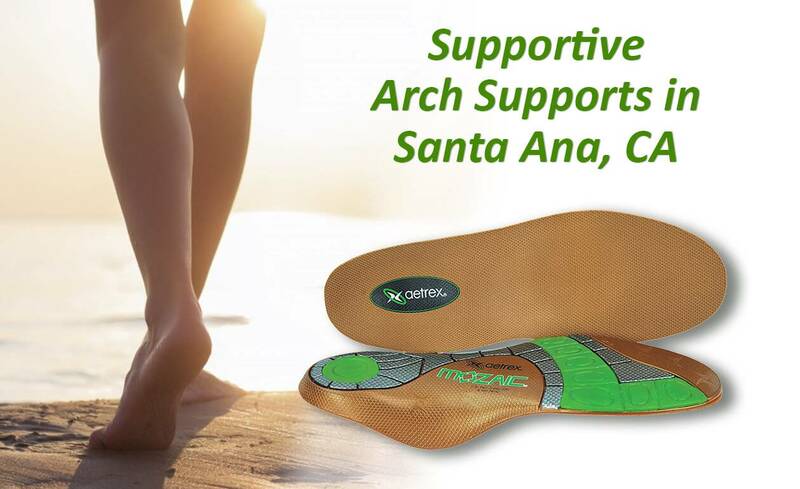 At Lucky Feet Shoes, we guarantee you’ll find supportive orthotics and arch supports in Santa Ana, CA. Lucky Feet Shoes of Santa Ana is your one-stop-shop for arch supports and comfort footwear. Whether you prefer to shop online or instore, at Lucky Feet Shoes of Santa Ana, CA we have a large selection of over-the-counter arch supports. We invite you to stop by for a FREE FOOT ANALYSIS and find the best orthotics or arch supports for your needs.